Being affected by the US presidential election USD has lost its power and at the same time EUR is being weakened due to the economic reports from Germany. The support rests at 1.10860 with resistance at 1.11400 which both lines are above the weekly pivot point at 1.0945. The EMA of 10 is moving with bullish bias and it has crossed the EMA of 100 and EMA of 200. The RSI is moving in overbought area, the Stochastic is going horizontally in high ranges and the MACD indicator is in positive territory. The ADX is showing buy signal at the moment. 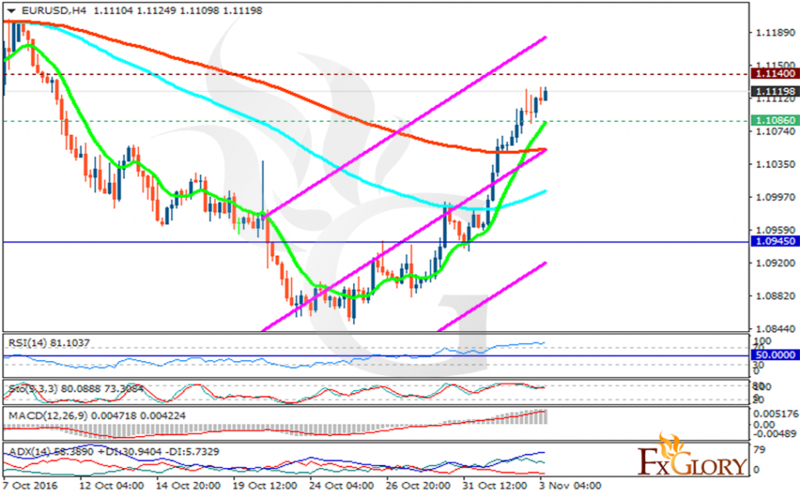 The pair will rise along the ascendant channel targeting 1.1086.